3Bet Pro Kyle Julius raises all in from the cutoff for 455,000 and Ben Yu tanks for about 60 seconds before he reraises all in over the top from the small blind. The flop comes down , giving Julius a set of eights to take a commanding lead. The turn is the , leaving Yu two outs to come from behind. The river is the , no help to Yu, giving Julius the double. Nitis Udornpim moves all in from under the gun for 290,000 and Bart Lybaert moves all in for more from middle position. Everyone else folds. The board runs out to give Udornpim a full house, and he doubles up. Ben Yu opens the action to 95,000 and Christian Blech calls from the big blind. The flop is and Blech checks. Yu bets 100,000 and Blech folds. Karl Held raises from the cutoff to 100,000 and everyone folds. Christian Blech raises to 105,000 and everyone folds. Kyle Julius shoves all in from under the gun for around 450,000 and everyone folds. Hugo Perez raises to 90,000 and everyone folds. Christian Blech raises to 125,000 from the button and George Dolofan moves all in from the big blind for a total of 135,000. Blech calls. The board runs out to give Blech Broadway and Dolofan is eliminated. Karl Held raises to 100,000 from middle position and wins the pot. Bary Lybaert raises to 65,000 from the cutoff and Christian Blech calls from the big blind. They check to the turn of a where Christian shoves for about 240,000. Lybaert folds. Hugo Perez limps in from the small blind and Kyle Julius checks his option. They check to the river of a board and Perez bets 50,000 on the end. Julius folds. Vinny Pahuja is in the cutoff. He looks at his cards, then thinks a moment before shoving all in for 305,000. 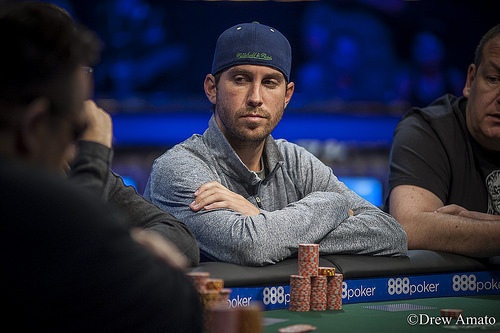 Karl Held is next to act and shoves all in on the button for 1,170,000. The blinds fold and Pahuja is heads up for his tournament life with against the of Held. The board runs out , giving Pahuja a bit of a sweat but it's not enough to double and he is eliminated. The final table of Event #4: Top Up Turbo No-Limit Hold'em starts today at noon. Karl Held leads the way with 1,175,000 and is just barely ahead of Hugo Perez (1,065,000). Both players are seeking their first WSOP gold bracelet. In fact Ben Yu (760,000) is the only player in the final nine with a bracelet. He won last year's $10,000 Limit Hold'em event. 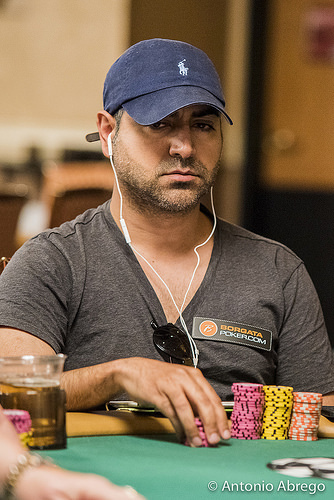 Karl Held had a wild last level yesterdaay, going down to under 200,000, then doubling through eventual tenth place finisher Mohsin Charania with pocket nines against . Held wasn't the only one who explored all the ups-and-downs of the fast structure. Midway through Day 1, Ben Yu knocked out three players on the same hand to take a commanding chip lead. He got in against Jessica Dawley, Ian O'Hara, and Matt Matros. Each had an ace and could not catch up to Yu. Yu leveraged his stack to push out to an even further lead, but hit a few speed bumps and comes into the day in fourth position. 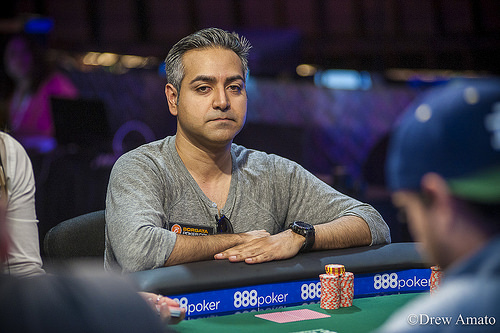 Vinny Pahuja comes in with just ten big blinds in eighth position. 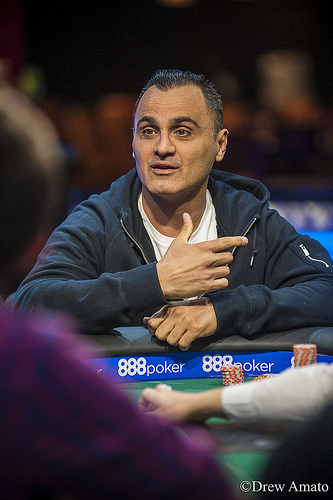 Pahuja has 42 WSOP cashes between the WSOP and the WSOP Circuit events. 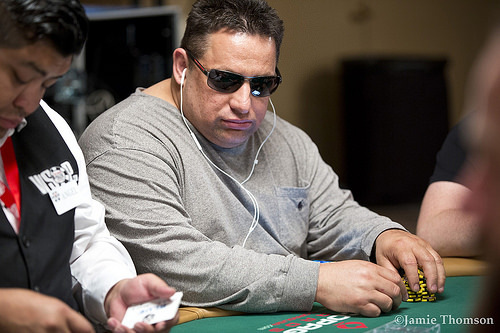 With over $360,000 in WSOP cashes he is seeking his first bracelet. George Dolofan enters the final table as the short stack, with just 160,000. He has already booked his first WSOP since 2009 and will likely be at risk early today with just five big blinds. The inaugural year of the Top Up Turbo has been fast-paced with stacks built and busted in a matter of moments. Today's final table promises more of the same. Play resumes at noon. Stay tuned to WSOP.com for updates and the live stream of the final table as the final nine players compete to be the first Top Up Turbo bracelet winner.